What should the embouchure look like? How would I help a student with a tight embouchure? How do I help students develop sound? Most often, attempting to fix an embouchure is like fixing only the surface-level symptom of a deeper problem. Many students (including my younger self) put a lot of focus on the embouchure because it's the one thing we can see clearly, and our band directors can see, too. I didn't come to understand and refine the fundamental aspects of sound until I came to understand the anatomy involved in playing. 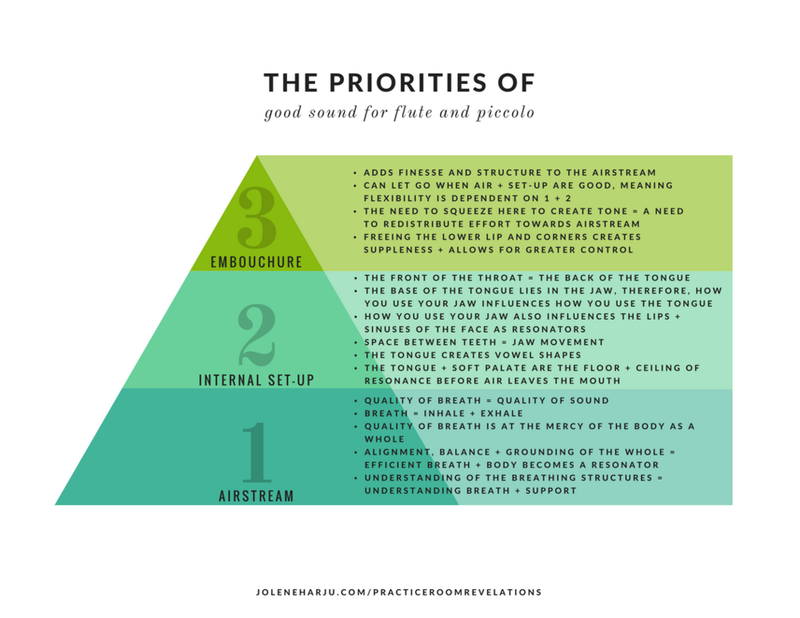 When all three aspects are refined and prioritized, sound becomes full and resonant, and students can begin to gain control and flexibility. Our self-use a whole determines the quality of the breath, and therefore the quality of the sound. To experience the difference, stand on your tip-toes and take a big breath. Then, stand on both feet and take a big breath. Which is more comfortable? Is there a difference in how each feels between these two different ways of using yourself? There are subtle habits of use embedded in our playing that can affect breathing in the same way. Therefore, looking at the whole can improve breathing, and thereby, sound. My primary goal for my warm-up is getting air moving. Read about it here! Utilizing the whole to find freedom over forcing: Read about it here! A Simple Trick for Better Breathing: Observe how you use yourself to inhale: Read about it here! So, we've mentioned embouchure and airstream, but the structures between the lungs and the lips play a crucial role in developing sound, as well. As before, understanding the anatomy of these structures can lead to a more refined and effective means of use. Statements like "open the throat" or "drop the jaw" are well-meaning tips to help students create openness and fullness to the sound. If the foundation of breathing or anatomical knowledge isn't there, attempting to open the throat may turn into forcing and lead to throat tension or noise. Have a look at this video. Although it's about swallowing, in the first 60 seconds, the narrator points out just how large the tongue is, and that the base of the tongue is in the oral pharynx. She'll also point out the hard palate and soft palates. The tongue is the floor of our mouth, and the palates are the ceiling. Increasing the amount of space in the mouth creates resonance. Therefore, tongue down, soft palate lifted will increase the space in the oral cavity. Understand that the tongue is large and dome shaped, and the base of which sits in the jaw and the oral pharynx. Therefore, the jaw and the tongue are closely related. The back or base of the tongue, as seen above, is essentially the front of the beginning of what we might consider to be the throat. Therefore, the tongue heavily influences our airsteam, and how "open" or "restricted" it is. We use these structures to ensure airflow hasn't been restricted, and to create vowel shapes that add depth to the sound. Where's My Jaw in Relation to the Whole? A Jaw-Dropping Skeletal Revelation: Read about it here! Singing adds speed and volume to the air stream, allows the mouth to create vowel shapes, and allows "open the throat" to occur in a natural way. Intentionally creating sound by singing can help alleviate throat tension and throat noise. Embouchure comes last because this is point at which we add structure and finesse to the airstream. When the fundamental elements are adequate and refined, the embouchure can begin to let go. A smiling, or tight embouchure with corners pulled back is a compensation for inadequate air, a closed throat or both. Here's one more video to see the muscles that move the mouth and the lips. The muscles below the the lower lip are important - often, the flute is too high on the bottom lip, and we can't use the lower lip for finesse and structure. If we try to lower the flute on the lip without the foundations of the pyramid, students won't have the tools ready to begin supporting well, and they'll lose sound, which is a scary experience! One more reason to look at the whole to make effective changes to the embouchure. Adequate support will also allow students to begin rolling out or uncovering more of the lip plate. In addition, the angle of the embouchure and flute-to-face are also the final elements to refining sound. Here are three experiments for making adjustments and finding the right angle! Here's a free visual aid with some important reminders to use for yourself or for your students! Click the image or the button below to download a PDF.